Shannon Hurn a rightful winner of the GlendinningAllan medal for his outstanding captain''s performance in the Eagles eighth-straight derby win. His 15 Intercept Possessions in tonight''s match, including a game-high six Intercept Marks, is a new career-high and he lead his team with 481 metres gained. Fremantle had a real chance at this game but were wasteful in front of goal, especially after managing just 5.10.40 from 86 Intercept Possession chains, compared to 6.6.42 from 72 Intercept Possessions for the Eagles. If ever a player deserved to be best on ground in a losing effort, David Mundy would be fairly judged the winner of the GlendinningAllan medal for his performance tonight. 36 disposals from 23 contested possessions, 529 mertres gained and 10 clearances is an outstanding performance from the stand-in captain. Josh Kennedy finishes off the Dockers tonight with one minute remaining. He has had an off night, only scoring from four of his seven shots at goal but along with Darling, they have kicked three goals each to lead the charge for the Eagles. A tremendous effort by Jack Redden in this final term. His nine disposals from four contested possessions, but more importantly 90 per cent possession retention rate has helped the Eagles outlast the Dockers in tonight''s match. 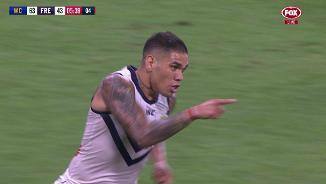 Michael Walters gets just reward for a big effort in tonight''s match and the Dockers are still alive with five minutes left. He has stuck all of his eight tackle attempts to double his tally for this season after recording just eight effective tackles from 21 attempts in the first three rounds (38 per cent efficiency). Matthew Taberner gets his second goal and keeps the dim hopes of the Dockers alive with six minutes remaining. He has worked hard to accrue 19 disposals and 452 metres gained, but his two goals from six shots at goal has proved costly. A terrific effort from young forward Oscar Allen to force the free kick and get the ball in quickly to allow Jack Darling to just about seal the result for the Eagles. West Coast have been a class above in the final term, earning 65 per cent time in forward half and three repeat entries inside 50 to wall off the Fremantle attack. Fremantle are shooting themselves in the foot in the final quarter and are making it hard for themselves to get back to within three goals. They have retained possession from just 31 per cent of disposals in the final term, compared to 67 per cent for the Eagles. The Eagles have had a few opportunities to really create some separation and ice this game, but have failed to capitalise. Three forward half Intercept Possessions have only reaped 0.1.1 this term. David Mundy has lead from the front and is a big reason the Dockers are still in this game. He has a gamehigh 16 contested possessions through three quarters tonight, his highest three-quarter contested possession count sine Round 19, 2016 against Sydney, and third-highest total of his career after three quarters. After doubling the Dockers for uncontested marks at half time (7839), West coast were only allowed to beat Fremantle 25-19 in this category in the third quarter. Four of West Coast''s five top ball-winners in the third term had possession retention rates below 45 per cent, including Andrew Gaff at just 17 per cent. A costly late turnover from Reece Conca gifts young forward Oscar Allen a goal to regain some momentum. Only GWS have a higher pointper-Intercept Possession rate than the Eagles after the first three rounds of 2019. Lachie Schultz has proven a headache for the Eagles defenders, recording a gamehigh 20 Pressure Acts so far tonight. He has caused a turnover from 11 per cent of Pressure Acts in his two previous matches this season, the highest Forced Turnover rate among the top 20 Dockers for total Pressure Acts. Shannon Hurn has had a strong quarter in defence for the Eagles. He is the only Eagle with multiple Intercept Possession this term (five), including two Intercept Marks. He also has 145 metres gained this quarter. Fremantle have been far more aggressive in pursuing the ball outside the contest this quarter, winning 18 postclearance contested possessions to just eight for the Eagles this term. 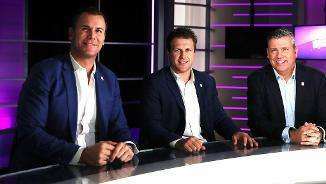 Dockers InterchangeLuke Ryan off due to the blood rule. Backto-back goals for the first time tonight for Fremantle, and find themselves now just three straight kicks down midway through the third term. Both goals have been launched from their Attacking Midfield zone this term. They average 27 points per game from this zone in 2019, the equal sixth-highest average score total from this zone this year. After a quiet first half, with just five disposals and two inside 50''s, Jesse Hogan finally records his first goal in Fremantle colours. His goal was Fremantle''s first from a set shot tonight. Prior to tonight they averaged eight goals per game from this shot type, the fourthhighest average in the AFL in 2019. 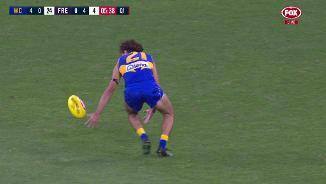 Josh Kennedy kicks his second goal of the game and the first of the second half to add to the Eagles lead. He has two goals from two contested marks tonight, as part of a game high six score involvements. Tom Hickey has been a standout for the Eagles through the first half, and should be employed heavily in the ruck during the second half. He has won 12 hitouts from 14 ruck contests, which gives him the highest first half hitout win percentage (86) in any game this year. Fremantle have done well to limit the Eagles aerial dominance in their forward half, conceding just two oneon-one contest wins to the Eagles from 11 offensive contests (18 per cent win rate). Geelong rank last in this category after three rounds with an offensive one-on-one win rate of 22 per cent. Neither team managed to launch any scores from stoppages in the second quarter of tonight''s match. This happened earlier in the season during the Hawthorn v Western Bulldogs Round 2 match. Hawthorn went on to not score another point from a Clearance in the remainder of that match. 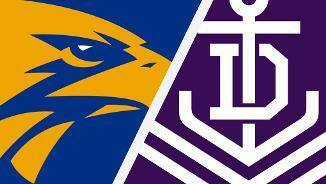 Will the Eagles or Dockers experience a similar drought tonight? Adam Cerra is having a decent game guarding fellow young gun Jack Petruccelle. He leads all players with four Intercept Marks tonight. Brad Sheppard leads all players with eight Intercept Possessions. Luke Shuey has a gamehigh three clearances this term, however all three of them have resulted in opposition giveaways, an area where the Eagles have been hurting themselves this quarter (seven turnover from clearances to zero for Fremantle). Brad Hill is leading his team this term with 150 metres gained, however he is costing his team with this aggressive ball movement, as the Dockers have not retained possession from any of his four disposals this term. In a similar vein, this is Josh Kennedy''s 15th match in a row with two or more marks inside forward 50. He also leads the AFL for this record, ahead of Tom Hawkins who is next best at seven straight games. This is now Matt Taberner''s eighth straight game with at least two contested marks recorded. That is the longest active streak in the AFL in this category, ahead of Harry McKay (five games in a row). Just like that, David Mundy''s fifth contested possession for the quarter, a contested mark, launches Fremantle''s first goal. He also leads all players with three clearances to go with four score involvements. Dockers InterchangeJoel Hamling and is possibly out for the game. David Mundy has been busy early this term, recording four groundballgets. No other player on the ground has more than one this quarter. Only Nat Fyfe (29) has recorded more groundball-gets this season for the Dockers than Mundy (25). 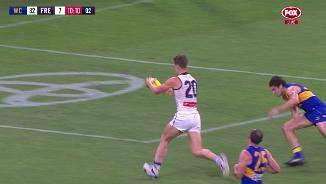 The Eagles kickmark game style is just starving the Dockers of possession to eat back into this lead. The Eagles have already recorded 30 uncontested possessions this quarter to just 13 for the Dockers, which includes 20 uncontested marks to five. Alex Pearce has had a strong start to this match, winning two of his four defensive oneon-one contests in the first term. He hadn''t conceded a mark from a defensive one-on-one contest in 2019 until Josh Kennedy took a mark on him and kicked the final goal of the first quarter. After Liam Ryan''s goal at the 17 minute mark, Fremantle were dominating the Eagles in contested football, recording a contested possession count of 158 and four out of five clearances. However this translated to just one behind on the scoreboard for Fremantle. In just his second game back after an injuryinterrupted preseason, Jamie Cripps has been of great importance to the Eagles already in the first term, with all three of his kicks inside 50 hitting the target, a game-high in this category. Rory Lobb just won Fremantle''s first hitout of the match after the Eagles won nine of the first 11 ruck contests. 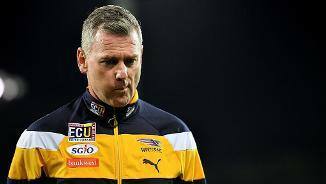 As a result, West Coast have outperformed the Dockers from one of the stronger elements of their gameplan, outscoring them 3.0.18 to 0.2.2 from this source. Both teams coming into this Derby had been among the most efficient scoring teams in the AFL in 2019. 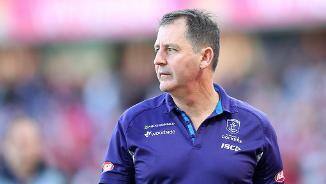 Fremantle have scored from 8 per cent more inside 50''s than their opponents in the first three rounds; the Eagles have done the same from 6 per cent more, ranked second and third in the AFL respectively. 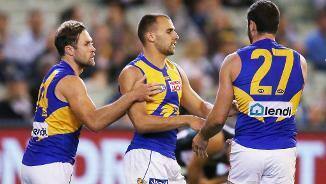 But the Eagles have four goals from 11 inside 50''s tonight; Fremantle, none from 10. Fremantle are getting plenty of touches of the ball but their kicking efficiency is really letting them down. They are going at 59 per cent efficiency by foot early in the first term, and three of their seven kicks inside 50 have gone directly to the opposition. A terrific goal from right on the boundary about 20 metres out from goal to Jack Darling. West Coast have scored a goal from 90 per cent of shots at goal from this distance to goal, the highest accuracy in this zone in the AFL this year. In his 50th game for the club, Ed Langdon has really stepped up in the absence of Nat Fyfe early in the first quarter. He has seven disposals from four contested possessions for 138 metres gained, all gamehighs. Fremantle have given away two straight free kicks for holding immediately after a centre bounce, gifting the Eagles two Centre Clearances in a row and all the momentum to begin the first term. 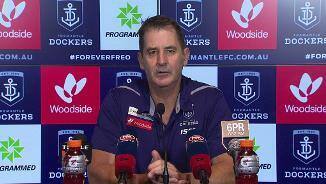 In 2018, Fremantle averaged conceding five more points than they scored from Clearances, the fourthworst differential measure in this category last year. Through the first three rounds of 2019, they lead the AFL averaging 16 more points launched from Clearances than their opponents per game. Nat Fyfe misses his second Perth Derby in a row, giving Elliot Yeo the early favouritism to claim backto-back Glendinning-Allan medals. 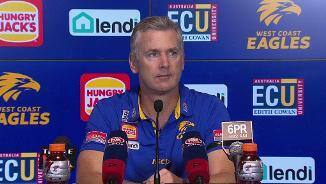 It is also Andrew Gaff''s first AFL Home and Away game in Perth since the ugly incident involving Andrew Brayshaw in the last Derby. Providing what could be an intriguing, and tonguetwisting, matchup battle, West Coast''s Liam Ryan has retained possession for his team from 60 per cent of his inside 50 targets, the second-highest retention rate of all players in the AFL with 10 or more targets inside 50 in 2019. West Coast have won a free kick as a direct result of a tackle laid on 15 occasions after the first three rounds, the equalfifth highest total in this category this year. A pair of emerging defenders have been key to the Dockers great start to 2019. Luke Ryan leads the AFL with 12 Intercept Marks after three rounds, to go along with Ethan Hughes leagueleading five goals launched from his Intercept Possessions. Welcome to Optus Stadium for the West Coast Eagles v Fremantle Round 4 clash. 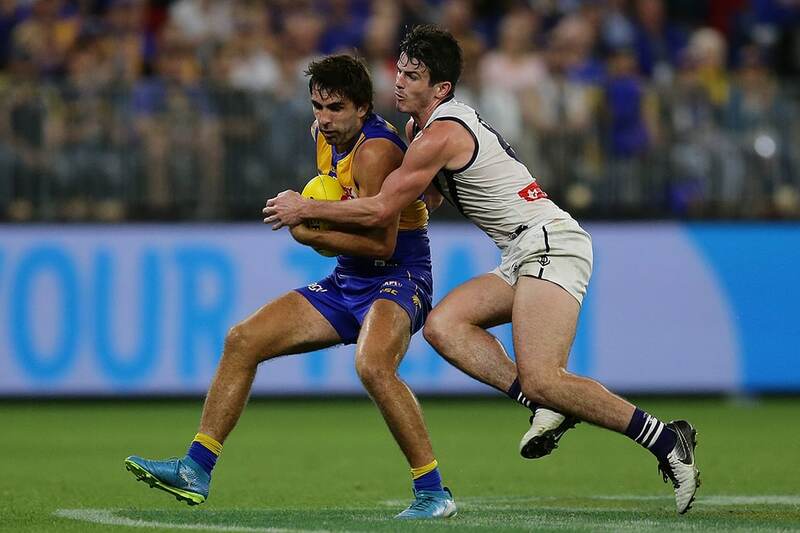 West Coast reminded Fremantle who is the king in the west but the young Dockers showed the Eagles' crown is a bit shaky in a combative Western Derby on Saturday night. Gaff's first Derby since he punched Andrew Brayshaw and received an eight-match ban was a roaring success. Eagles fans' pointed cheers managed to drown out the Docker boos and in the blink of an eye Gaff had 10 first-quarter possessions and the Eagles had five goals on the board to nil. Dockers veteran and acting captain David Mundy (36 possessions) was huge at the coalface and comfortably Freo's best player in the absence of skipper Nat Fyfe. The opening term was even in most facets of the game, except the one that counts – the scoreboard. Both teams had 13 inside 50s but the slick, efficient Eagles nailed 5.1 while Fremantle butchered its ball movement heading forward and a couple of set shots to be 0.5 at the first change. The Dockers raised their bar in the second quarter, enjoying more than their fair share of the ball but managed just 1.9 to half-time. And while it didn’t quite click after the long break, the Dockers chugged into gear through sheer will. Jesse Hogan’s first goal for the club was followed by two in a row to Cam McCarthy to get the underdog within nine points. The victory makes it eight Western Derbies in a row to the Eagles and takes the overall ledger to 29-20 in West Coast’s favour.